Oakhurst Neighborhood Association, Fort Worth, Texas: September Oak Leaflet Now Online! September Oak Leaflet Now Online! Check out this month's issue of The Oak Leaflet in full color online! 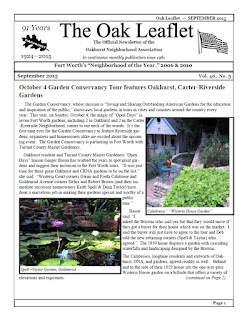 This month's newsletter features the upcoming Fort Worth Garden Conservancy Tour (featuring two of our neighbors' gardens), a North Sylvania Street traffic update from Jan, Fred's monthly patrol report, September's Yard of the Month by Fran, and more details on the upcoming Police and Firefighter Appreciation Dinner. Save the Dates: October Events! West Nile Virus Meeting This Thursday!